Tokyo Gas Group has been creating and enhancing LNG value chains for over four decades, and highly environmentally friendly, securely suppliable, and versatile natural gas is at the core of our business development. Below we explain the benefits of the natural gas and city gas systems that form the foundations of the Group's business. The natural gas that we use to make city gas offers a variety of outstanding features. Natural gas consists mostly of colorless, odorless, clear methane, which produces less carbon dioxide (CO2) when combusted than other fossil fuels like oil and coal. 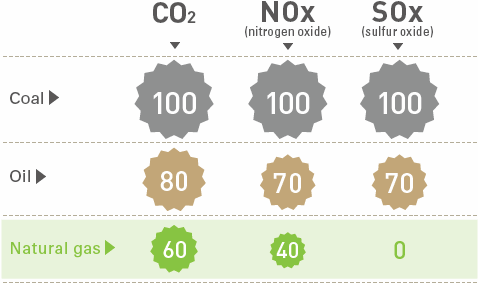 It also produces lower nitrogen oxides (NOx) emissions, which are a cause of photochemical smog, and no sulfur oxides (SOx), which cause asthma and acid rain, giving it significant potential as a clean and environmentally friendly energy source. Source: Agency for Natural Resources and Energy, Energy White Paper 2013 and Energy White Paper 2014. There are abundant reserves of natural gas around the world, and "unconventional" natural gas reserves are also being developed today, especially in North America. Technological innovations have made possible the commercial development of these previously unprofitable resources, broadening the potential for sourcing stable supplies of cheaper natural gas and thereby greatly improving supply security. Significantly, we source our LNG primarily from Southeast Asia, which makes us less dependent on the Middle East. Although LNG demand is rising worldwide, our involvement in upstream gas field projects and our receipt of LNG from them gives us secure access to competitively priced LNG procurement sources. Source: IEA World Energy Outlook 2015. 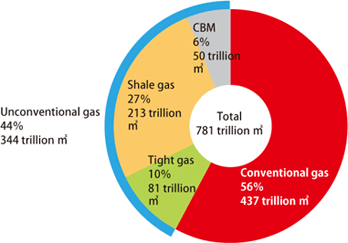 Unconventional gas is gas that is produced from sources other than ordinary gas fields. 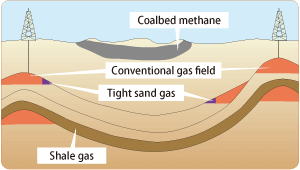 One example is coalbed methane, which is a form of natural gas consisting mainly of methane generated when coal forms. This is adsorbed in the coal and retained in coal beds. 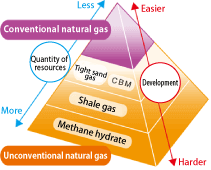 Tight sand gas is natural gas that has accumulated in hard, non-porous rock such as sandstone. The ongoing development of such unconventional gas resources in North America has given the United States an approximately 50% share of world output of these three types of natural gas as of 2009, and experts predict that this figure may exceed 70% by 2035. Tokyo Gas is also involved in shale gas development projects in the Cordova Basin in British Columbia, Canada, and the Barnett Basin in Texas, U.S. Enormous potential resources Source: JOGMEC News, Vol. 26. Natural gas is an outstanding primary energy source that can be converted to different forms for various uses (such as steam, heat, and cold energy) to efficiently and flexibly meet all kinds of urban and regional needs. 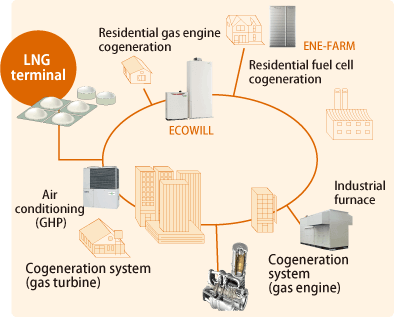 By pairing natural gas use with cogeneration systems capable of making simultaneous, efficient use of heat and electricity wherever energy is needed, we seek to enhance area-wide energy supply stability, further decentralize energy systems, and make a major contribution to the development of a low carbon society. We import LNG from overseas by tanker and store it in LNG tanks at LNG terminals. It is then vaporized and the calorific value adjusted before being supplied to the customer as "city gas" via a pipeline network measuring over 60,000 km in length. Key facilities such as terminals and pipelines are built using the latest expertise and technologies and have structures designed to fully withstand a major earthquake measuring intensity 7 (Great Hanshin Awaji Earthquake class). As natural gas is vaporized at the terminal and supplied by pipeline as city gas, there is no loss due to energy conversion or transportation until the gas reaches the point of consumption. In some regions where gas pipelines have yet to be laid, LNG is transported by tanker truck to satellite terminals, etc. where the LNG is vaporized and supplied.